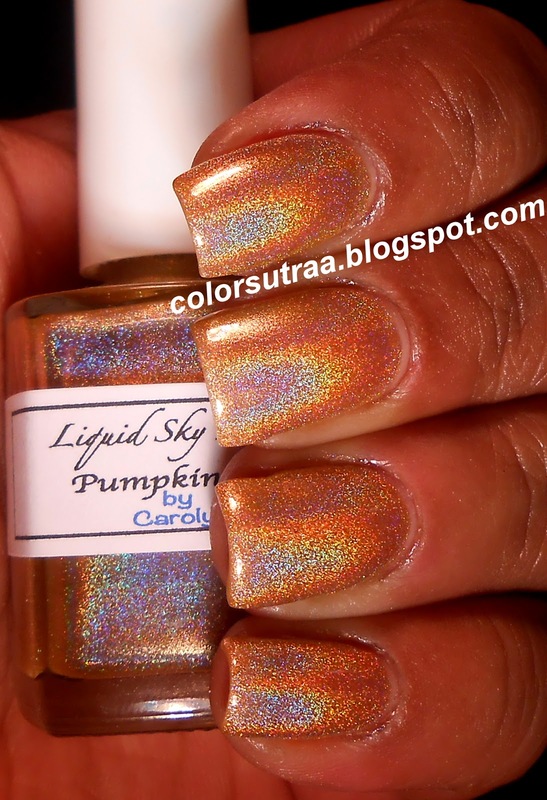 First, I have for you Pumpkin Pie--a light pumpkin orange linear holographic with gold undertones. 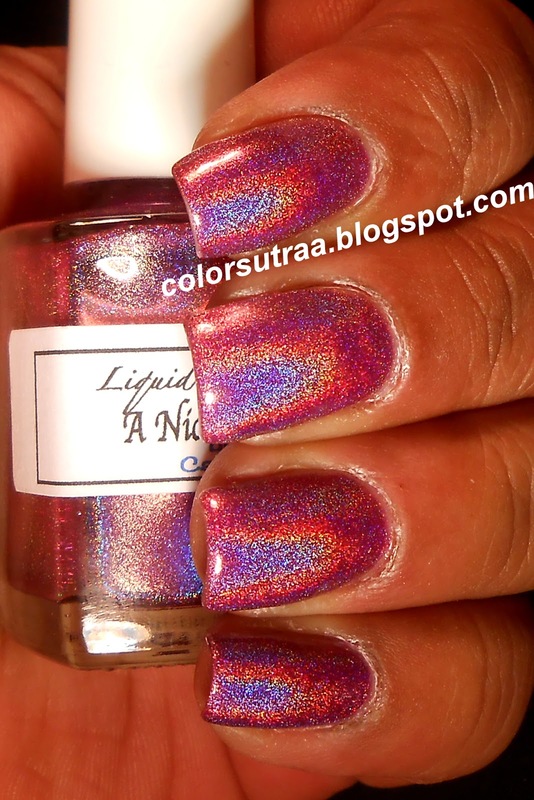 The formula and dry time was fantastic and I used 2 coats for the swatches below. I must say, when I looked at this in the bottle, I was really confused as to why Carolyn named it as she did but once on my nails, it all made perfect sense--this is exactly like a slice of warm pumpkin pie swirled with a dollop of whipped cream! Delicious! Next, I have for you one of my two favorites of this collection, A Nice Chianti--a lush, wine-purple with a strong linear holographic effect. This polish was a little more sheer than Carolyn's other polishes and I used 3 generous coats, topped with 1 thin coat of G&G's HK Girl. Dulling of the holo? I don't think so! And this was blinding in the sunlight! I got so many compliments at work! The third beauty in this collection is Autumn Thyme--a minty medium green linear holographic polish. I used 2 coats for the swatches below and once again, the formula was fabulous! This is an absolutely must-have for those of you who crush on greens! Next, we come to the second of my favorites, Mulled Wine--a rich, wine-red polish with a strong linear holographic effect. This, like A Nice Chianti, was a little on the sheerer side and I used 3 generous coats, topped with 1 thin coat of G&G's HK Girl. So gorgeous! I'm absolutely in LOVE with this shade! Last but not least, we have Spice Cake--a warm caramel linear holographic polish, that's just PERFECT for Fall! This, too, was on the sheerer side and I used 3 generous coats, topped with 1 thin coat of G&G's HK Girl. This shade is SO yummy! So there you have it, darlings! These polishes will be restocked, along with the release of the new shades I showed you in the previous post, on this Saturday, September 28th--follow her on Facebook HERE to keep updated with the latest on the exact time. On Saturday, you can find them HERE for a price of $12.50 for a full-sized, 0.5 oz bottle! Which one is YOUR favorite? Tell me in the comments section below!